Few topics have received such attention in our generation as that of the Holy Spirit and the Christian. Much of the teaching heard lays heavy stress upon a direct operation of the Spirit on the heart of alien sinners to bring them to salvation, and supernatural enlightenment and guidance for Christians. We will examine these points in light of God's Word and see what is actually promised. The Holy Spirit is a divine person, a member of the holy godhead. It is erroneous to think of him as merely a power, influence or feeling. Masculine pronouns are applied to the Spirit (John 14:26). Attributes of personhood are given him. He speaks (Revelation 2:29); he leads (Romans 8:14); he forbids (Acts 16:6). The Holy Spirit plays a vital role in our salvation. We are baptized into the name of the Father, the Son and the Holy Spirit (Matt. 28:19). He is the seal of our salvation and the "earnest of our inheritance" (Ephesians 1:13-14). TO WHOM IS THE HOLY SPIRIT GIVEN? Contrary to popular opinion, God's Spirit is not given to alien sinners to convert them. "Because ye are sons, God sent forth the Spirit of his Son into our hearts" (Galatians 4:6). The Spirit through the inspired Scripture works on the minds and hearts of sinners, convicting them (John 16:8; 1 Peter 1:23). When the sinner believes the gospel message, repents and is baptized, he receives remission of sins and the gift of the Holy Spirit (Acts 2:38). Thus the Spirit comes, not to make us sons, but because we have become Sons of God. God's Spirit is only given to those who in faith obey Christ. "We. . . receive the promise of the Spirit through faith" (Gal. 3:14). Jesus said "He that believeth on me. . . from within him shall flow rivers of living water. But this spake he of the Spirit, which they that believed on him were to receive. . . " (John 7:38-39). Peter tells us of "the Holy Spirit whom God hath given to them that obey him" (Acts 5:32). Jesus said, "how much more shall your heavenly Father give the Holy Spirit to them that ask him?" (Luke 11:13). The context makes clear that he gives this gift to his children! We should be reminded that Scripture speaks of a baptism of the Holy Spirit which only the apostles and Cornelius received (Acts 1:5; Acts 11:15-17) and the miraculous gifts of the Spirit given by the hands of the apostles (Acts 8:12-18). 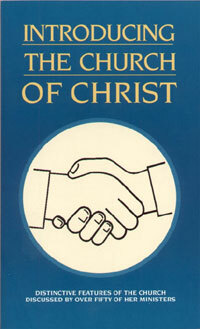 (Only the apostles could pass the gifts along to others, the recipients could not.) There also is a general gift or indwelling of the Spirit which all receive at baptism. This is non-miraculous (Acts 2:38). Holy Spirit baptism was promised to the apostles, but never commanded of disciples. Only two cases of it are recorded at the first reception of Jews and Gentiles into Christ's kingdom. Both cases involved open displays of supernatural power (see Acts 2:1-13 and 10:44-48). Today there is but one baptism (Eph. 4:5). This baptism of the Great Commission is in water (Acts 8:37-38). It is a remarkable privilege to receive God's Spirit in our lives. Such carries with it heavy responsibilities. "Know ye not that your body is a temple of the Holy Spirit which is in you, which ye have from God? and ye are not your own;. . . glorify God in your body" (1 Cor. 6:19-20). "If any man destroyeth the temple of God, him shall God destroy; for the temple of God is holy, and such are you" (1 Cor. 3:17). Thus any habit or practice that would defile our body and soul must be cast aside, be it fornication, drug abuse, indulgence in intoxicating beverages, gluttony, tobacco or any like thing. We must "walk by the Spirit, and. . . not fulfill the lust of the flesh" (Gal. 5:16). By that, Paul means to order our lives by the Spirit's instructions found in the Scripture. "For the law of the Spirit of life in Christ Jesus, (makes) me free from the law of sin and death" (Rom 8:2). "For as many as are led by the Spirit of God, these are sons of God" (Rom 8:14). The Holy Spirit has given us the Bible to guide our path (2 Peter 1:20-21). Christians must put away all things in their lives that would grieve the Holy Spirit (Eph. 4:25). In Ephesians 4:17-5:14 the apostle catalogs that ugly list of sins we must put away if we would please our heavenly guest. At the same time we must fill the vacuum in our lives by bringing forth the fruit of the Spirit: "love, joy, peace, long- suffering, kindness, goodness, faithfulness, meekness, self-control. . . " (Gal. 5:22-23). Although no miraculous power or leading is promised to us today, the blessings bestowed by the indwelling Spirit are manifold. When at our baptism we receive the gift of the Spirit (Acts 2:38) it is likened to God's seal or stamp of approval or ownership (2 Cor. 1:22). His presence in our life is the earnest or assurance of our ultimate reward in heaven (Eph. 1:13-14). Our possession of the Spirit is an assurance of our sonship: "hereby we know that we abide in him and he in us, because he hath given us of his Spirit" (1 John 4:14). "The love of God hath been shed abroad in our hearts through the Holy Spirit which was given unto us" (Rom. 5:5). We "abound in hope, in the power of the Holy spirit" (Rom. 15:13). Christians are "strengthened with power through his Spirit in the inward man" (Eph. 3:16). "And in like manner the Spirit helpeth our infirmity" (Rom. 8:26a). When we do not know how to pray as we ought, "the Spirit himself maketh intercession for us. . . according to the will of God" (Rom. 8:26-27). Paul urges us to pray "at all seasons in the Spirit" (Eph. 6:18). By the Spirit (we) "put to death the deeds of the body" (Rom. 8:13); thus we find help to overcome those powerful habits of sin which have attached themselves to us. When we walk in the fear of the Lord we enjoy "the comfort of the Holy Spirit" (Acts 9:31). The Holy Spirit leads the Christian in paths of righteousness. "For as many as are led by the Spirit of God, these are the sons of God" (Rom. 8:14). Many claim the Spirit whispers words in their ear or overpowers their mind, but such is not Biblical. The Holy Spirit leads us through the instruction of the Scripture he caused to be written. Scripture came as "men spake from God, being moved by the Holy Spirit" (2 Pet. 1:21). In Ephesians 5:19 Paul instructs us to be filled with the Spirit and sing. In Colossians 3:16 he says "Let the words of Christ dwell in you richly" and sing. Thus with David we pray "Show me thy ways, O Jehovah; teach me thy paths, Guide me in thy truth and teach me. . ." (Psalm 25:5). Truly Scripture "is a lamp unto my feet, and light unto my path" (Ps. 119:105). It is the medium by which God's Spirit leads us. Led by the Spirit we enjoy "the communion of the Holy Spirit" (2 Cor. 13:14) and the. . . "fellowship of the Spirit" (Philippians 2:1). In a similar way "the Spirit himself beareth witness with our spirit, that we are children of God" (Rom. 8:16). In his word, the Spirit has told us the conditions of salvation; i.e., faith (Hebrews 11:6), repentance (Acts 17:30), immersion (Mark 16:16). When our spirit can truthfully say, I have met these terms" then the Spirit's Word says "he that believeth and is baptized shall be saved" (Mk. 16:16). Those who have God's Spirit in their hearts will reflect it in their attitude and con- duct. They will love the Bible which the Spirit caused to be written. "I have longed after thy precepts" (Ps. 119:40). "I love thy precepts" (Ps. 119:159). Sinners receive "not the love of the truth that they might be saved" (2 Thessalonians 2: 10). Spirit filled men will confess that Jesus Christ is come in the flesh (1 John 4:2). They will be led by the Spirit's word (Rom. 8:14) and mind "the things of the Spirit" (Rom. 8:5). With the Spirit's help they will be mortifying the sinful desires and practices of the old life (Rom. 8:13). In their lives will be seen "the fruit of the Spirit. . . love, joy, peace, longsuffering, kindness, goodness, faithfulness, meekness, self-control. . ." (Gal. 5:22-23). The implanted word of God which the Spirit inspired is able to save our souls (James 1:21). In every case of conversion recorded in the Acts of Apostles, souls were saved only after hearing the word of God taught and obeying the divine will (Compare Acts 2:1-47). The Lord today will open your heart even as he did Lydia's by the preaching of the gospel (Acts 16:11-15). He will remove your sins even as he did Saul of Tarsus' when you respond by being baptized (Acts 22:16). Without God's Spirit, you cannot be saved (Rom. 8:9). It is impossible to receive the Spirit apart from Christian baptism (John 3:5). We urge you today to let Christ save you "through the washing of regeneration (baptism) and the renewing of the Holy Spirit" (Titus 3:5). In so doing you will find "righteousness, peace and joy in the Holy Spirit" (Rom. 14:17). How do we conclude that the Holy Spirit is a person? In Scripture, who received the Baptism of the Holy Spirit? Name three obligations of those who have the Spirit. Discuss the blessings the Holy Spirit provides Christians today. What is the evidence of the Spirit dwelling in one's life?